Use in patients >18 years of age with already-diagnosed COPD by spirometry (FEV₁/FVC <0.7) with baseline symptoms and lung function. Do not use to diagnose COPD and do not use in patients with acute exacerbation. Patients with COPD with recent spirometry results available in the ambulatory setting who are at their baseline with regard to symptoms and lung function. Do not use in patients suffering an acute exacerbation or worsening of respiratory symptoms. The GOLD Criteria were developed and primarily validated for patients >18 years of age. The GOLD Criteria are used clinically to determine the severity of expiratory airflow obstruction for patients with COPD. Should not be used to diagnose COPD, but rather to categorize clinical severity to inform prognosis and to guide therapeutic interventions. Determining a patient’s GOLD status requires a multidimensional assessment of a patient’s spirometry, symptom burden, and frequency of COPD exacerbations. Spirometry is measured by formal pulmonary function testing, and the percent predicted of the forced expiratory volume in 1 second (FEV₁) is the value used in calculating a patient’s GOLD status. Symptom burden is quantified by either the modified Medical Research Council (mMRC) Dyspnea Scale or COPD assessment test (CAT) score. Exacerbation frequency encompasses the number of acute symptomatic deteriorations of COPD over the past 12 months requiring either increased medical management or hospitalization. GOLD status (A-D) explicitly guides therapeutic interventions for management of stable, baseline COPD, with GOLD A patients requiring less medical management than GOLD D patients. The 2017 GOLD Criteria predict mortality risk for patients with COPD, but not more accurately than the earlier GOLD scores (Leivseth and Soriano). Stage B may predict higher mortality than stage C COPD, as determined by the 2011 GOLD Criteria (Lange). GOLD status in the 2011 criteria does predict risk of exacerbation better than the older, spirometrically-based GOLD Criteria (Lange and Soriano). GOLD stages B, C, and D do not accurately reflect patient’s functional status as measured by 6 minute walk testing, London Chest Activities of Daily Living Scale, or daily life activity monitoring (Moreira). The therapeutic guidance coupled to GOLD stages is primarily based on expert consensus rather than direct evidence supporting specific therapeutic recommendations for a given GOLD stage; however, the individual medications and clinical interventions are supported by relatively strong level of evidence. Predicts risk of future COPD exacerbations (Lange and Soriano) and mortality (Lange, Leivseth, and Soriano). Can serve as a framework to discuss disease management and risk reduction for patients with COPD. GOLD stages are linked to specific therapeutic recommendations for medical management for both chronic COPD, as well as suggestions for acute exacerbations. Derived from and described in a global patient population, implying relevancy for use in a wide variety of clinical and geographic settings. When clinically appropriate, patients with respiratory symptoms and risk factors for COPD should undergo spirometry to determine FEV₁ and FEV₁/FVC. Patients meeting spirometric criteria for airways obstruction and clinical criteria for COPD should have their GOLD status determined. Non-pharmacologic and pharmacologic treatments based on a patient’s GOLD stage should be considered and initiated as clinically appropriate (see Management below). Referral to a pulmonologist should be considered for patients whose COPD is GOLD stage C or D, or patients with difficult-to-control symptoms or frequent COPD exacerbations regardless of GOLD stage. Education about the nature, prognosis, and outcomes of COPD should be emphasized in initial and subsequent patient visits. Discussion of and recommendations about behavioral risk factors must be performed, including (primarily) smoking cessation and avoidance of secondhand smoke. Avoidance of indoor and outdoor air pollution (including biomass fuel in appropriate settings), a potential trigger for a COPD exacerbation, should be emphasized. Age- and clinically-appropriate vaccinations should be provided. GOLD stage A: A bronchodilator should be offered (long- or short-acting as clinically indicated.) This medication should be continued if there is symptomatic response. GOLD stage B: A long-acting bronchodilator (either a long-acting bronchodilator [LABA] or long-acting methacholine antagonist [LAMA]) should be prescribed as initial therapy. GOLD stage C: LAMA is appropriate initial management for a patient with GOLD stage C disease, although patients with stage C disease and a history of frequent exacerbations may benefit from LAMA + LABA or LABA + ICS (inhaled corticosteroids) combination therapy for initial management. GOLD stage D: Initial treatment with combined LAMA and LABA therapy is indicated for GOLD stage D, with consideration of adding of an inhaled corticosteroid (ICS) for patients with frequent exacerbations. Patients with GOLD stage B, C, or D disease and high symptom burden should be referred to and encouraged to participate in pulmonary rehabilitation. GOLD Criteria cannot be used to assess disease severity in patients without a measured recent FEV₁. Treatment interventions initiated based on GOLD stage must always be considered in the context of an individual patient’s response, and medications should be adjusted accordingly. Patient education about the risk of airways obstruction and COPD should be emphasized for former and current smokers, regardless of spirometry results or GOLD stage, and smoking cessation encouraged. The GOLD Criteria do not capture or characterize former and current smokers who do not meet spirometric criteria for COPD (defined as FEV₁/FVC <0.70), as these patients are still at increased risk of respiratory symptoms (Woodruff). GOLD 1–4 refers to the grade of airflow obstruction, and GOLD A-D are the groups on which treatment recommendations are based. From the Global Strategy for the Diagnosis, Management and Prevention of COPD, Global Initiative for Chronic Obstructive Lung Disease (GOLD) 2017. *From Lange 2012, based on GOLD 2011 criteria. The GOLD Criteria were first described by the Global Initiative for Chronic Obstructive Lung Disease (GOLD) in 2001 as a point-of-care means of assessing and characterizing the severity of COPD. The original 2001 GOLD Criteria, as well as the 2006 update, were defined by the FEV₁ percent predicted: the worse the FEV₁ percent predicted, the worse a patient’s disease severity. The original, spirometrically-based GOLD Criteria were widely disseminated and widely used clinically, as the criteria represented an easy to use clinical tool that was linked to treatment interventions. Increasing awareness of the importance of symptoms, coupled with increased visibility and psychometric characterization of symptom scores such as the mMRC and CAT, led to a major revision in the GOLD Criteria in 2011. Specifically, symptom burden (as measured by the mMRC or CAT) and exacerbation frequency were coupled to FEV₁ percent predicted to generate a more comprehensive disease severity assessment tool. The revised and updated 2011 GOLD Criteria were demonstrated to be more accurate with regard to predicting COPD exacerbations (Lange and Soriano), although there does not appear to be a difference in predicting mortality as compared to the 2001 and 2006 GOLD guidelines (Leivseth and Soriano). 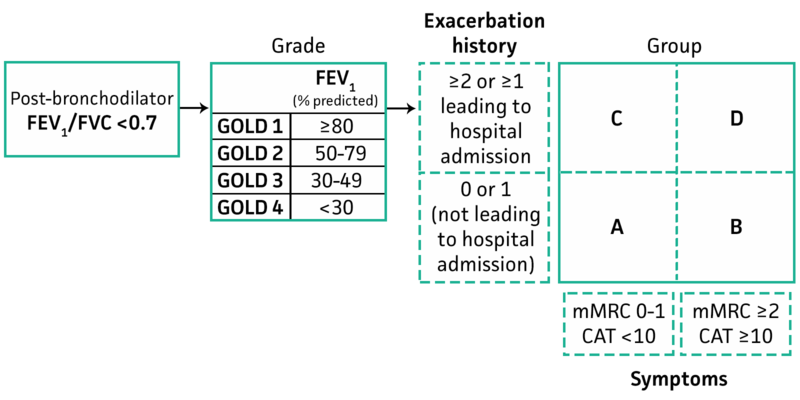 Perceptions of confusion in coupling three different metrics of disease severity (FEV₁, symptom burden, and exacerbation frequency) led to the 2017 GOLD guidelines to separate FEV₁ from symptom burden and exacerbation frequency (see Formula), to establish the GOLD stage A, B, C, or D.
The data regarding accuracy and reliability for clinical outcomes associated with GOLD stages A-D are primarily retrospective in nature and entirely descriptive of the GOLD 2011 criteria (there are no data for the GOLD 2017 guidelines). A large study from Denmark assessed 6,628 patients demonstrated a sequential increase in exacerbation frequency from GOLD stage A (2.2% per year) to GOLD stage D (28.6% per year), with an increase in mortality from GOLD stage A to D, but a decrease in mortality from GOLD B to C (see table in Facts & Figures) (Lange). A second retrospective study in Spain assessed 3,633 patients with COPD (93% men), and demonstrated a sequential increase in mortality over 10 years for patients stratified as GOLD A, B, C, and D (Soriano). Data regarding the performance characteristics of and clinical outcomes associated with GOLD 2017 staging is anticipated to be forthcoming, and will likely be similar to GOLD 2011 performance given the similarities in the construction and composition of the 2011 and 2017 GOLD Criteria. Petsonk EL, Hnizdo E, Attfield M. Definition of COPD GOLD stage I. Thorax; 2007;62(12):1107-1108. Mannino DM, Sonia buist A, Vollmer WM. Chronic obstructive pulmonary disease in the older adult: what defines abnormal lung function?. Thorax. 2007;62(3):237-41. Antonelli-Incalzi R, Imperiale C, Bellia V, Catalano F, Scichilone N, Pistelli R, Rengo F; SaRA Investigators. Do GOLD stages of COPD severity really correspond to differences in health status?Eur Respir J. 2003 Sep;22(3):444-9. Vestbo J, et al. Global strategy for the diagnosis, management, and prevention of chronic obstructive pulmonary disease: GOLD executive summary. Am J Respir Crit Care Med. 2013 Feb 15;187(4):347-65. doi: 10.1164/rccm.201204-0596PP. Epub 2012 Aug 9. Lange P, et al. Prediction of the clinical course of chronic obstructive pulmonary disease, using the new GOLD classification: a study of the general population. Am J Respir Crit Care Med. 2012 Nov 15;186(10):975-81. doi: 10.1164/rccm.201207-1299OC. Epub 2012 Sep 20. Soriano JB, et al. Distribution and prognostic validity of the new Global Initiative for Chronic Obstructive Lung Disease grading classification. Chest. 2013 Mar;143(3):694-702. Maleki-Yazdi MR, et. al. Early detection and impaired quality of life in COPD GOLD stage 0: a pilot study. COPD. 2007 Dec;4(4):313-20. Leivseth L, Brumpton BM, Nilsen TI, Mai XM, Johnsen R, Langhammer A. GOLD classifications and mortality in chronic obstructive pulmonary disease: the HUNT Study, Norway. Thorax. 2013 oct;68(10):914-21. Moreira GL, et al. GOLD B-C-D groups or GOLD II-III-IV grades: Which one better reflects the functionality of patients with chronic obstructive pulmonary disease? Chron Respir Dis. 2015 May;12(2):102-10. Woodruff PG, et al. Clinical Significance of Symptoms in Smokers with Preserved Pulmonary Function. N Engl J Med. 2016 May 12;374(19):1811-21. Edward Petsonk, MD, is a professor of medicine at West Virginia University. He is a practicing pulmonologist and critical care physician and has been published in the literature on occupational deficits due to lung disease. Dr. Petsonk is also a retired captain in the US Public Health Service.